Making hard boiled eggs can be tricky…learn my tips to make the perfect hard boiled egg every time! Hard boiled eggs are a life saver for breakfast during busy mornings! Recently, I have been enjoying 2 hard boiled eggs with cottage cheese. It sounds SO strange but it is a delicious protein packed, low-carb breakfast that keeps me full for most of the morning. And it’s minimal labor! Speaking of minimal labor…I am sure most if not all of us have spent WAY too much time taking the shell off of a hard boiled egg before, right? I believe I have mastered the way to make hard boiled eggs now and am excited to share with you my tricks and steps! Don’t use eggs that you JUST purchased: For example, when I buy a dozen eggs in the store, and know I want to make hard boiled eggs with them…I let them sit in the fridge for 1 week before I decide to boil them. This makes the hard boiled eggs easier to peel! Here is what happens when you let the eggs sit for ~1 week: they lose moisture through small pores in the shell, and the air pocket at the tip of the egg gets larger. Also, the pH level of the whites rise as they age, which makes them adhere less strongly to the shell. First step…place eggs in pot with water with KEY ingredients: Use an appropriate sized pot. Eggs should be in a single layer, covered with about 1-2 inches of water. Try not to cram them in either, they should have space between them. ALWAYS add in salt and white wine vinegar. Depending on how many eggs you are making depicts how much to use. I typically eyeball it. If you are making 6 eggs, I would use 1/2 tsp. salt and 2 Tbsp. white wine vinegar. These ingredients are another step to help pull the skin away from the eggshell so they peel easily. Bring to rolling boil for 2-3 minutes: Bring the eggs to a rolling boil for 2-3 minutes. After your time is up remove from heat and cover with a lid for 12 minutes. (2-3 minutes depending on how creamy you like your yolk). Don’t forget the ice bath! : After the eggs have been sitting for the 12 minutes, place them directly into a bowl with ice and water. I usually use a slotted spoon to get the eggs out.Let sit in ice bath for 20-30 minutes. (This also helps pull the membrane away from the shell for easy peeling). You can enjoy immediately or keep them in the fridge for later. 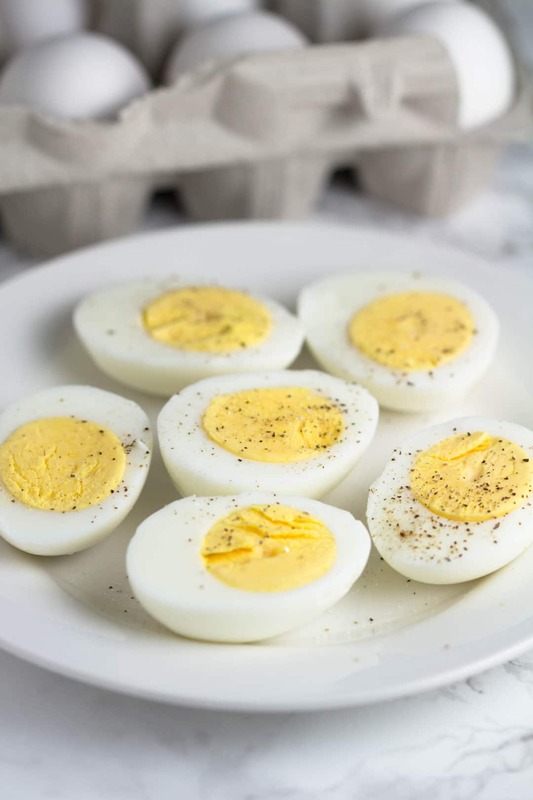 What are your tips to making the perfect hard boiled egg? I’d love to hear!